« Two Brains. So What? In the mid-1790s, an English country doctor named Edward Jenner made a rather routine observation: milkmaids don’t get smallpox. Milkmaids were often exposed to cowpox, a disease that’s related to smallpox but much less deadly. Cowpox gave the milkmaids flu-like symptoms that were distressing but certainly not lethal. Jenner guessed that the cowpox also conferred immunity to smallpox. Jenner wasn’t the first to observe the cowpox effect but he was the first in the western world to act on his hunch. He created a vaccine from the scraping of cowpox pustules and administered it to some two-dozen people. They all acquired the immunity to smallpox. Jenner conducted experiments to demonstrate the treatment’s efficacy as well as the biological mechanisms in play. As a result, he is often described as the father of modern immunology. How does one learn to be a good observer? Interestingly, most critical thinking textbooks don’t address this. Rather, they teach readers how to ask insightful, clarifying questions. That’s useful, of course, but also somewhat limited. Observation is merely a continuation of questioning by other means. Much more than questioning, observation can reveal fundamental insights that produce important innovations – like Jenner’s. How does one become a good observer? Here are some thoughts I’ve gleaned from reading and from my own experience. Pay attention – this may seem obvious but it’s hard to do. We’ve all had the experience of driving somewhere and not remembering how we got there. The mind wanders. What to do? Remind yourself to stay in the moment. Make mental notes. Ask yourself why questions. Mindfulness training may help. Keep a journal – you can’t observe everything a given moment. Observations grow and change over time. You may have half a good idea today. The other half may not occur to you for years. Steve Johnson calls it a slow hunch. The trick to a slow hunch is remembering the first half. If it’s written down, it’s much easier to recall. (Indeed, one of the reasons I write this blog is to remember what I’ve learned). Slow down – it’s much easier to think clearly and observe effectively if you take your time. The pace of change may well be accelerating but accelerating your thinking is not going to help you. Pay attention to System 1 – your fast, automatic system knows what the world is supposed to be like. It can alert you to anomalies that System 2 doesn’t recognize. Enhance your chance by broadening your horizons – Pasteur said, “Chance favors only the prepared mind.” You can prepare your mind by reading widely and by interacting with people who have completely different experiences than yours. Diversity counts. Look for problems/listen to complaints – if a person is having a problem with something, it creates an opportunity to fix it. Test your hypothesis – in other words, do something. Your hypothesis may be wrong but you’ll almost certainly learn something by testing it. Observing is not always easy but it is a skill that can be learned. Many of the people we call geniuses are often superb observers more than anything else. Like Edward Jenner. Postscript – Jenner inoculated his first patient in May 1796. Once Jenner showed its efficacy, the treatment spread quickly. So did opposition to it. In 1802, James Gillray, a popular English caricaturist, created the illustration above. 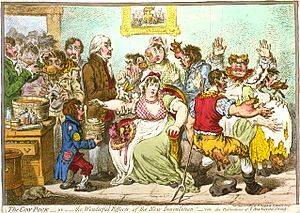 Opponents claimed that cows would grow out of the bodies of people who received cowpox vaccines. Anti-vaccine agitation has been entwined with public health initiatives since the very beginning.